Having chased winds the day before, we were already in position for an expected outbreak on this day. But the models had overestimated the extent of the moisture return (a problem that had initiated from the stronger cold front within the past week). The truth was revealed on the day. We monitored the situation in the library at Liberal. 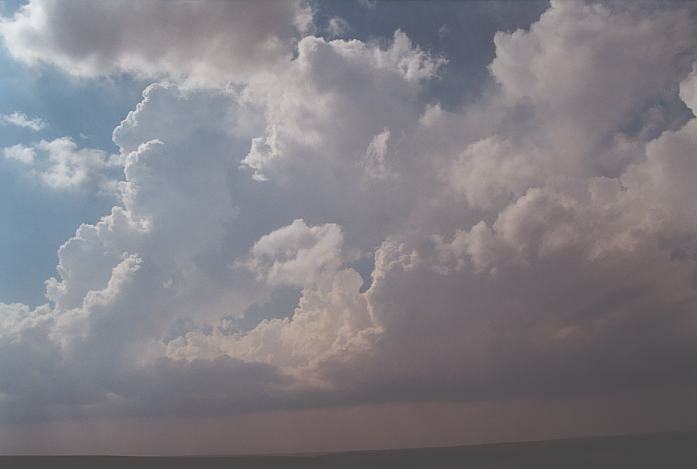 It looked favourable for initiation to occur in Central Kansas northeast of the Dodge City region. So we left for Dodge City. 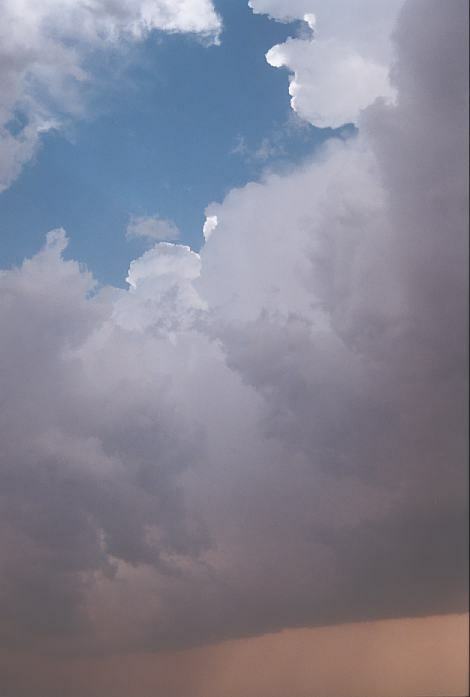 Stratus and cumulus patches were observed to the east as well as convection along the dry line creeping through nearby. Checking in at Dodge City library, we deduced that activity based on satellite imagery was going to initiate along the line that was heading down from northern Kansas stretching northeastwards into Nebraska. 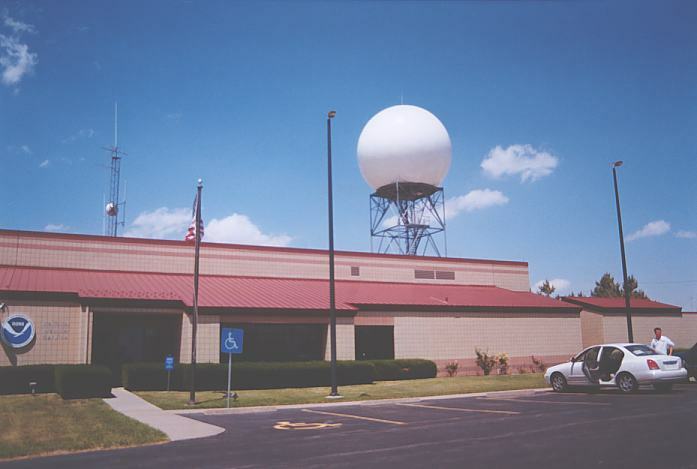 After visiting briefly the Dodge City National Weather Service office, we left there to head for Hays (advised as the initiation area by the NWS). 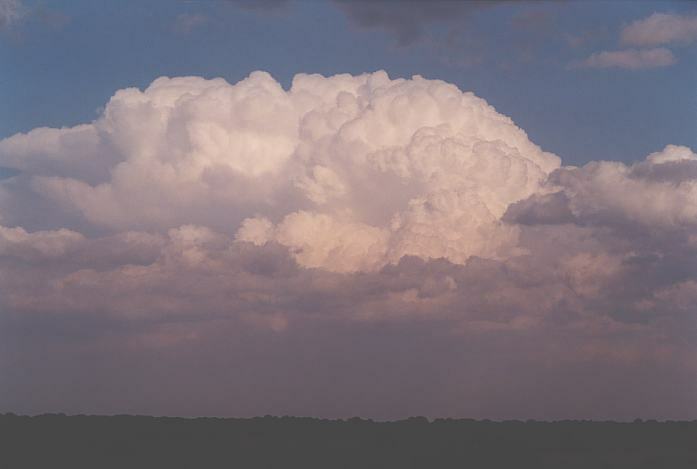 After becoming frustrated and somewhat mislead by the proposed targets rather than following instinct, we finally gathered that storms were developing further west and north of Hays. The moisture haze was covering our view. 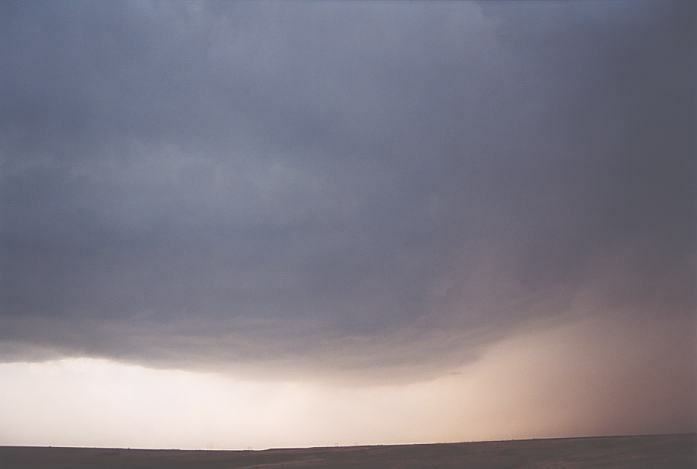 Parked on a road north of Hays, we watched cells gradually break the cap. A nice rain free base developed with rear flank downdraught. Just before 7:00pm, the storm began to escape northeast and not wanting to punch through the cell, we headed to Plainville and then east. From here on, we maintained south relative to our first mesocyclone. 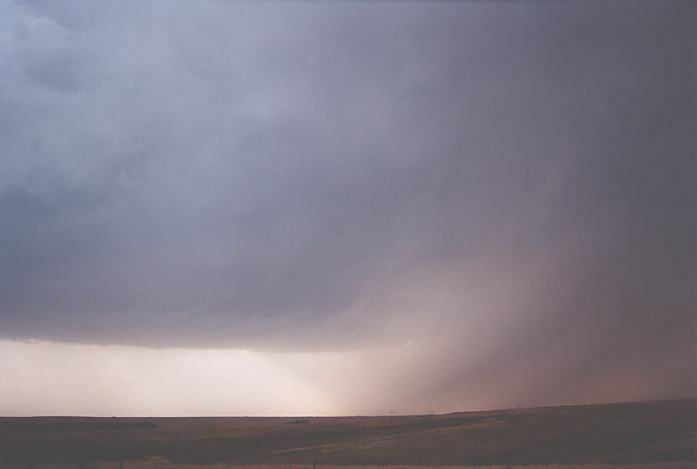 The first mesocyclone had developed a wall cloud and tried to put down a funnel. But it seemed the moisture was really lacking on this day and I felt that the directional shear was not as ideal. The supercell definitely was a hail producer though and this cell gradually lost its features and also moved northeast. The road network was not the best considering most were unsealed roads and especially with rain around. A second mesocyclone developed though did not do much except eventually become outflow dominant after a lowering initially developed. It was also a hail producer with hail drifts reported near Plainville and further east probably around the 7:30 to 8:00pm time period. I suspect the dense precipitation cascade would have been related to these drifts. We did enjoy the picturesque sunlit reflection of a storm to the south. 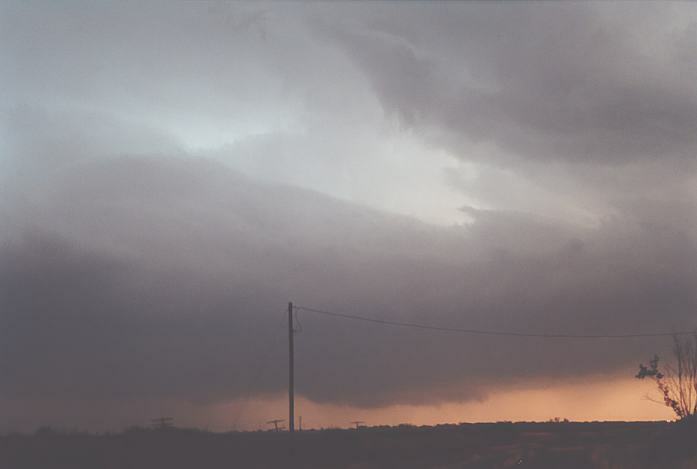 I thought the last mesocyclone, observed during the late evening about 8:00 to 8:30pm, was the most impressive with a wall cloud developing and even showing rotation. This rotation lasted for about 10 minutes but then also became outflow dominant with a shelf cloud developing. 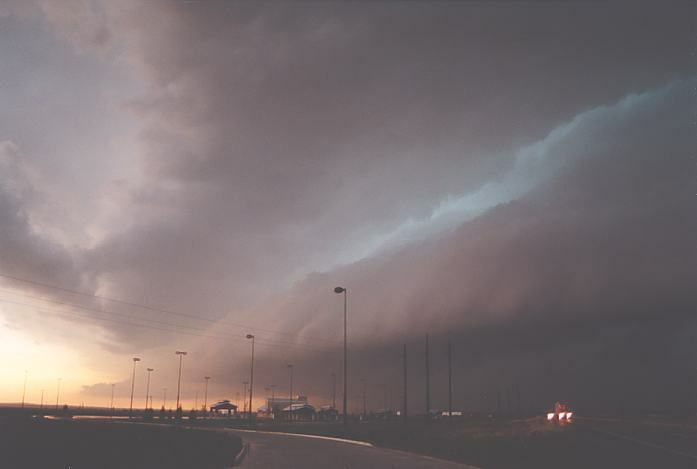 The front of the supercell was curved and there was crispy back-sheared anvil. 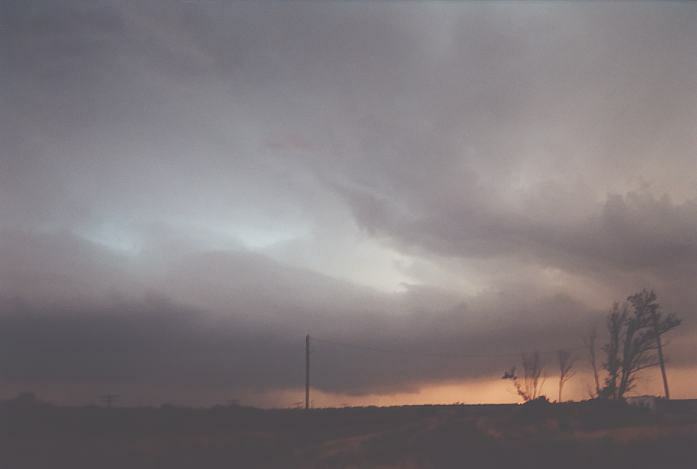 We called it a day when it became too dark to observe features and headed towards the storms which passed through Osborne. Severe runoff had existed around town. 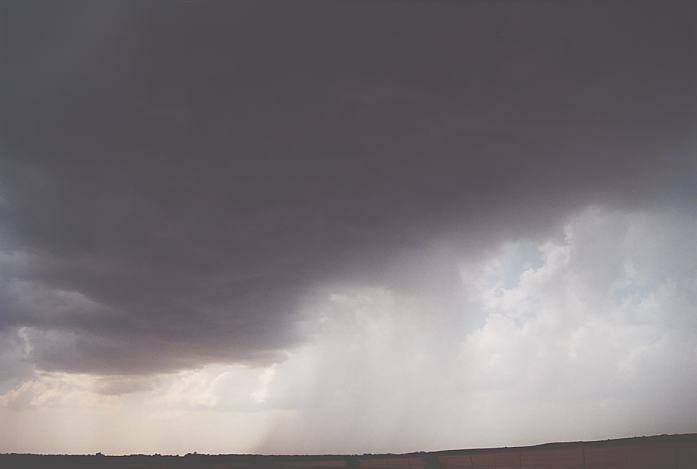 Locals suggested that this storm produced the best rain they had had for about a year. We awoke to cooler conditions once again. From Osborne, we headed south towards Russell. Checking the models at the library there, we figured the main action will be in the Texas panhandle. Originally, it looked that northern and western Oklahoma was to be a target but early and slow moving thunderstorm activity there put that out of the question. What this was going to do was send an outflow boundary towards the panhandle intersecting with the cold front which was slowly making its way through the Oklahoma and Texas panhandle. 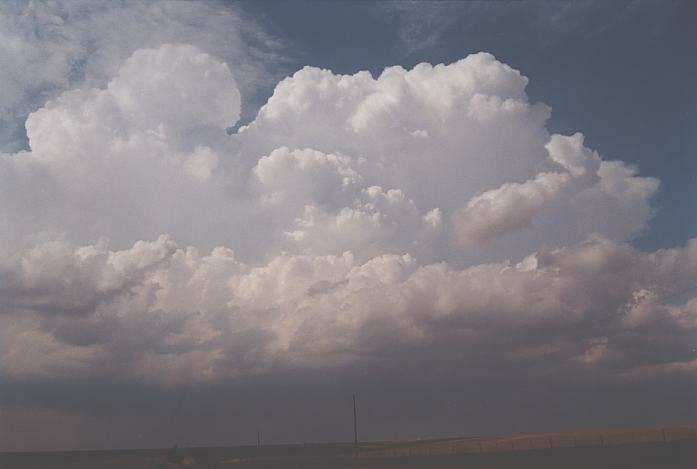 A dry line was to develop in the Texas panhandle and this made the region ideal for the development of supercells and possible tornadoes whilst these interactions took place. 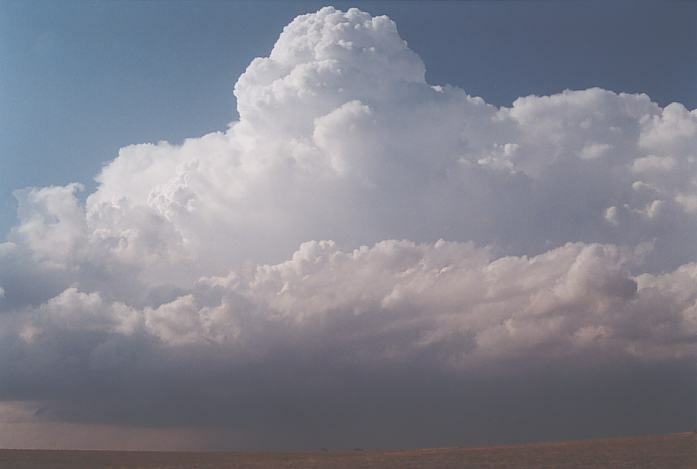 Wind shear was more than sufficient for supercells. A quick check in the libraries at Meade and Beaver confirmed that convection was occurring along the outflow boundary moving west. So the target area was around Canadian. Passing through the outflow boundary that had healthy convection taking place, we located just north of Canadian at a lookout and just south of the boundary. 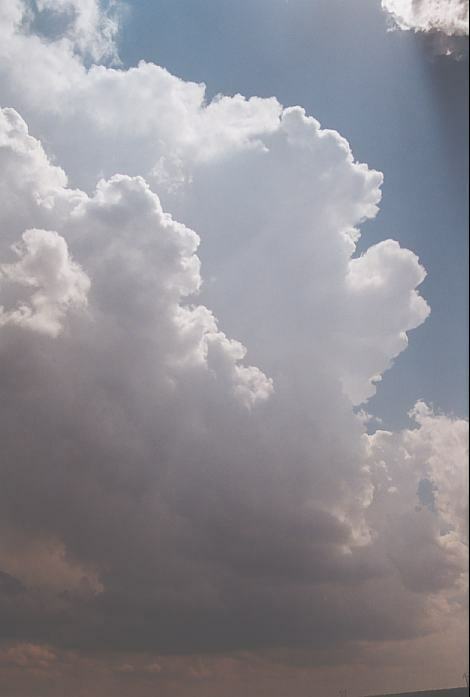 Here we could observe any action to the west, southwest and also the convection we had just passed under. Matthew prompted that the cell had taken off amidst the blocking cumulus to our north. 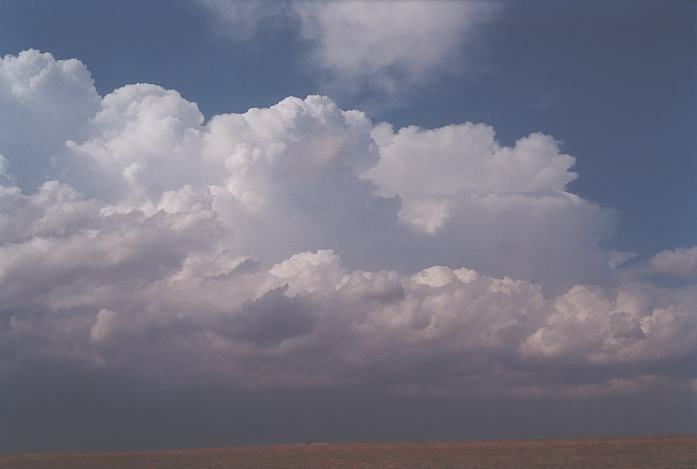 Cells were trying to the west and southwest with weak anvils and weak updraughts. That was my favoured target. But it was this cell to the north maturing with every updraught that stole the early show. At about 5:00pm, we were on the road east to Lipscomb. We parked at an elevated position with a view to all the action. The cell to the north had thunder audible and also a nice rain free base. Another updraught finally broke through the anvil indicating this storm had finally broken some mid level cap. Then another updraught powered up on the southern flank. Suddenly Matt calls out, "Dust whirls"... Wow!! Just as I was filming the exploding updraught. It was time to move further east and north closer to the cell. 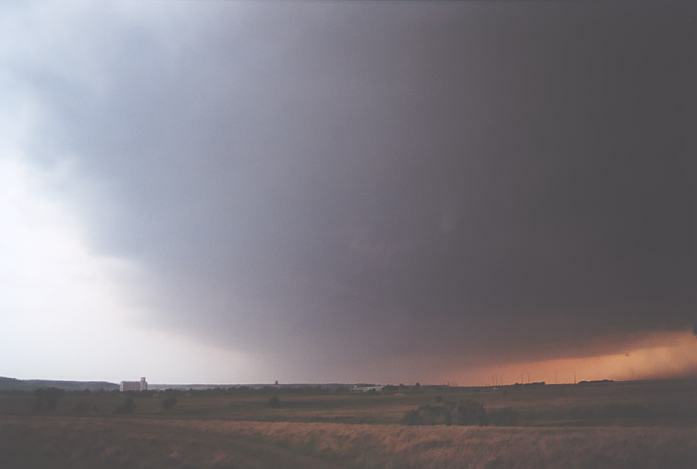 The storm had developed supercell characteristics with a powerful updraught now dominating on approach to the storm. More dust whirls were observed on the western edge along the boundary moving south. A little after we arrived, another dust whirl spun up this time closer to the central part below the rain free base. Then shortly before 6:00pm, another tightened plume spun rapidly upward slightly east of the previous spin up. On video this vorticity was rapidly moving east. It was an awesome display of nature!!! South east winds gusted towards the rain free base in response to the powerful pulses feeding more moisture to the storm. More dust whirls followed. Finally a wall cloud developed and didn't waste time organising with a rounded back to it. Dust agin was kicked up by the rear inflow and was sucked up into the wall cloud. We headed for another road to head east so that the storm would not cut us off. There was no precipitation evident along this stretch of gravel road. Wow - another dust whirl!!! A thin funnel now attached to the wall cloud with dust disturbance below. By the time we stopped in the next available position, it had ceased. A clear slot was evident now. More dust was raised further down the road but it seemed to be driven forward. 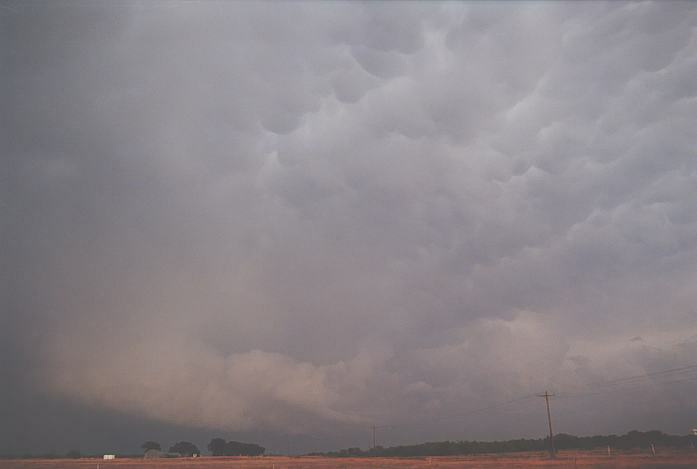 This was followed by low cloud on the ground on the north western side of the storm's boundary. The rear flank downdraught had dragged cold air to the surface. Another wall cloud developed as the cold outflow reached us. There was rotation but it was inevitable that this storm was changing to an outflow dominated pattern. We moved on ahead meeting up with other parked chasers. 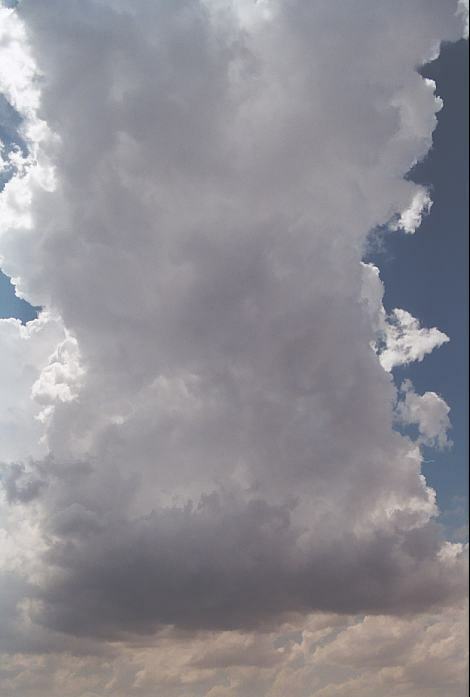 We found there still was a tornado warning on this storm with a confirmed tornado on the ground at the time of the major dust whirls just before 6:00pm!!! The tornado warning puzzled me as this storm had weakened significantly. But then it was allowed to expire. We were hearing warnings of base ball hail but could not work out which storm. Nevertheless, we opted to follow the anvil that had developed overhead and shadowed this rapidly weakened storm. Matt guided me to a sealed road to the south and then we headed west. 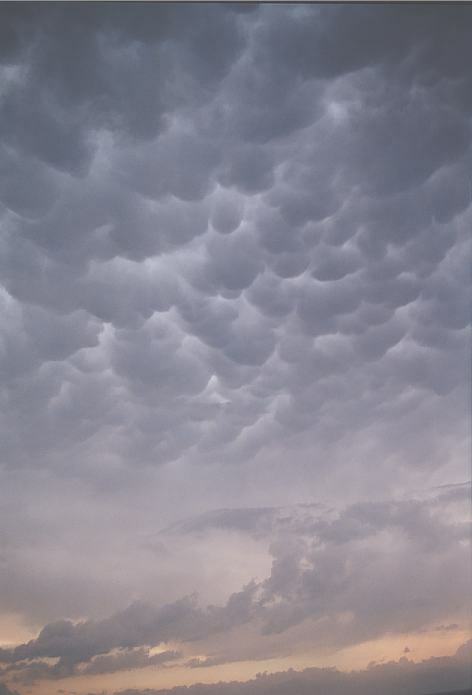 Stopping briefly to film mammatus above, we made our way west on the long route towards Spearman. There were mid level inflow bands observed leading into the main base. This base slowly began to emerge and it was soon clear that this anvil belonged to at least two cells. Finally we were en route 281 just northwest of Canadian. It was magnificent table top countryside with power poles merging in the distance. We were onto a major storm that had crossed north of the road. 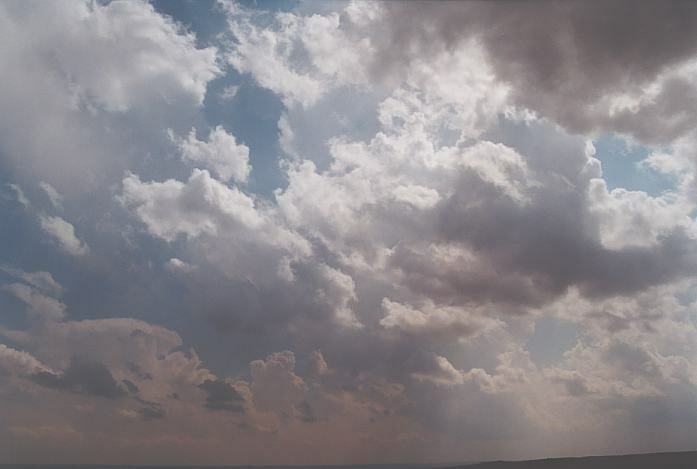 To the west, another cell was rapidly organising feeding on the outflow of this weakening cell. (I thought it had been a flanking line from the first storm - we had no radar to follow). This new cell was awesome exhibiting a clear vault region. It had developed clear rotation and had inflow from the northeast (from the weakening cell) and more flow from the east as well. This was channelling into the north eastern side. 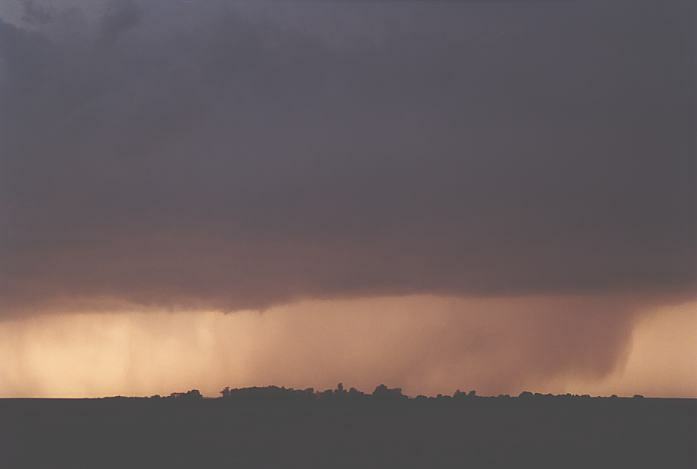 It was approximately 8:15pm that a tornado was spotted but became rain wrapped quite quickly. I also spotted rotation in the base of a wall cloud nearby. The storm had visible striations and hail streaks (not noticed until viewing the video). Suddenly we heard a thump. "That's hail". Some more thumps confirmed that with pure hail the size up to about 3cm or so followed by mixed rain and smaller hail. This was from near the vault region and anvil. Who knows what was in the core. 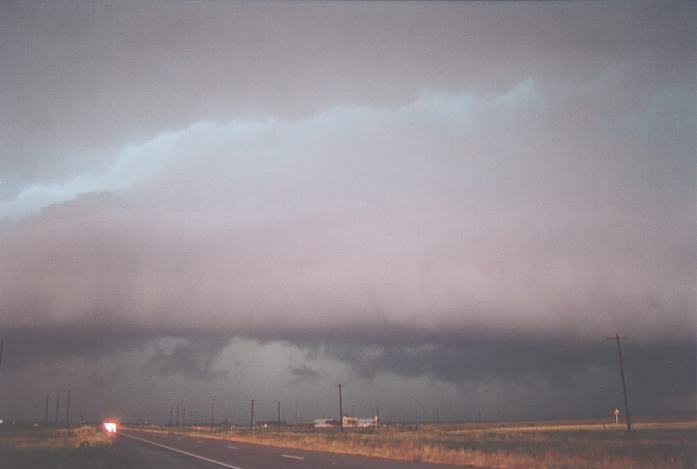 The core also hid the infamous monster Pampa storm from view. We made an attempt at heading south but other chasers heading back and increasing hailstone size forced us back. We were reluctant to chase through the core so headed east. 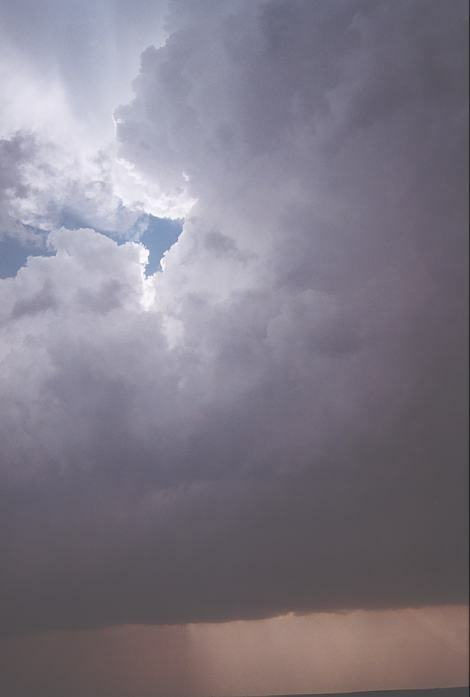 After booking a hotel, we searched for a lookout point to observe the lightning (the Pampa storm to the west). After all the storm was not so far away. Usually this is a good strategy. On this night, it wasn't. It wasn't too long before I realised that with such a strong and deep low level wind shear feed, this storm was hardly moving!!! It was only about 40km away but took several hours to reach Canadian. Gradually though, the storm did start to reveal its features. 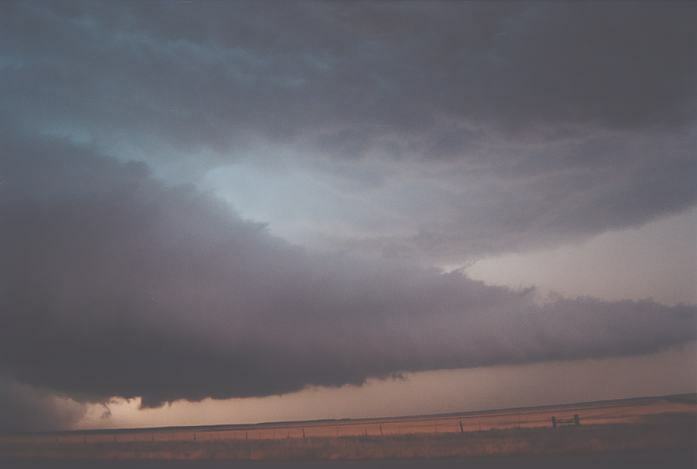 Inflow bands or streamers were observed from the front moving into the beast. Others located to the south of the storm observed some impressive features and a nice cow-catcher formation with strong inflow. Back at the hotel, we observed the storm was still very strong with serious hail warnings. The warning even at 11:30pm suggested that hail to the size of base balls had been confirmed by NWS trained spotters and this storm was able to also produce "brief but destructive tornadoes". Our cars were parked under cover as a precaution. We enjoyed updated discussions of the storm with some US chasers who booked the room next door!!! 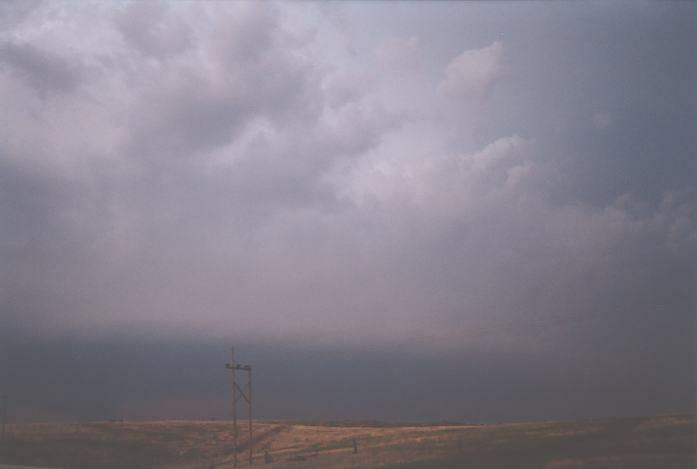 Thunder became more or less almost a constant rumble as the storm neared. Some impressive lightning bolts observed. I warned Matthew that this is a dangerous storm and watch where he stands - just the usual precautions. Then a sudden flash bang!!! This "crackling" thunder hit all of us in the heart!!! The images of the lighting from observing through the view finder blinded me for a couple of minutes:)) Lightning bolts and thunder became more frequent. But you guessed it, the storm had been making full progress to the town but weakened in the last moment - the core passing just to the north. All we got was hail to about golf ball size approximately 12:30am. I was able to video it using reflected light on the flat roof of a small building within the motel area. This ended up as another late night - again about 1:30am. But what a day. I enjoy those chases where the action never seems to cease!!! We awoke and had basically anticipated a moderate risk. Off to the library at Canadian. The jet stream indicated more strong wind shear near and north of the cold front. But the wind shear was sufficient for supercells in the target area where the best instability was situated. This instability and wind shear region would generally drift southwards ahead of the cold front during the evening hours. One thing was for certain, we were easily within reach of the target area. I chose the region northwest of Childress based on the latest model run and the arrival of the detected trough in the region. But I thought and was in a way hoping the initiation would occur around Memphis. Nevertheless, we headed south of Canadian and decided to check the library at Shamrock. Server had been stolen!!! Next stop Wellington. We could not find the library so we decided to just use our eyes and head to Childress if need be. I had the gut feeling that Childress would be populated with chasers. But we never ended up that far!! 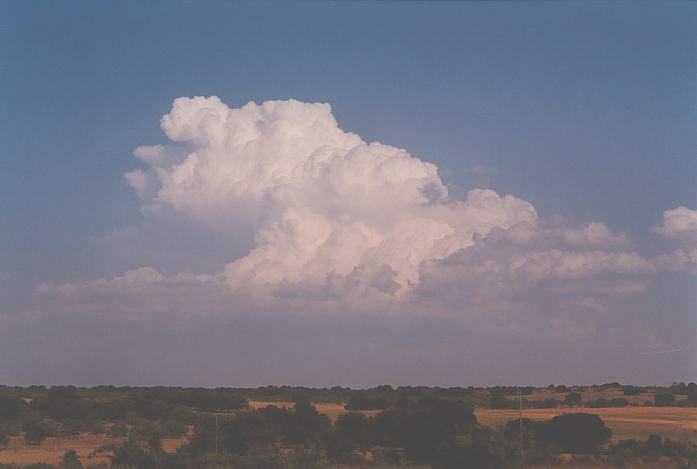 Prior to and still north of Childress, the congestus growth was gradually spreading northwest - sign of the trough. It felt more humid - higher dew points. Cold front to our north as well. We parked on an off road west of Route 83. Very hazy but certainly we were within range of cells set to break the cap. Finally, after hearing some static on the radio, we moved back to route 283 to be able to observe the glaciating anvil. 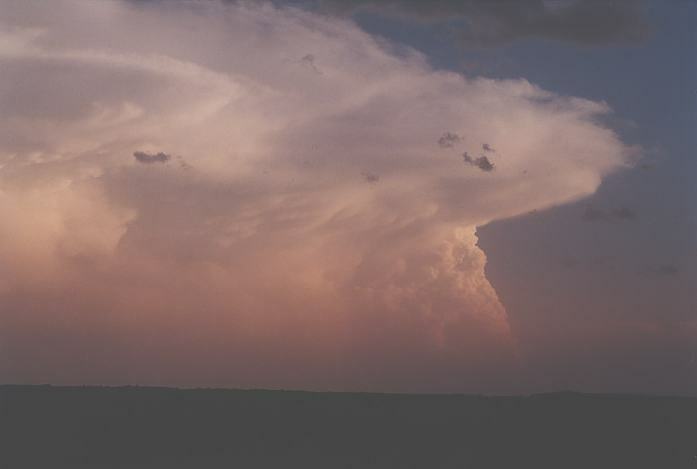 The storm rapidly began to organise and within 20 minutes had developed an anvil and hail structure with green tinge evident. Another cell had developed just west of our location leaning right over us but north of the first (mature) cell. A passer by stopped to see what was around. She was quite interested because she had not seen so many chasers around in this area. We could see a few chasers parked on the road further north. 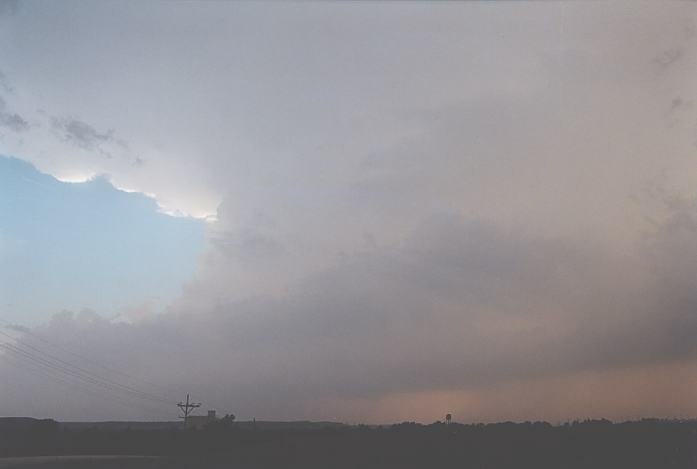 The storm did develop into the typical northeast southwest orientation typical of tornado alley outbreaks. There was a nice rain free base. Rotation was already evident but not significant enough and certainly not sufficient to bring down much of a lowered base. It also began to rain where we were from the now massive anvil. Inflow was fine but I felt insufficient since it was being rained on and cooled. This persisted so we made our move south. Crossing highway 287 we headed on the southern outskirts perhaps situated just to the southeast of Childress. This was the last of this current storm complex. We turned west and parked along the side of the road. The spotters were active and I could see why. Despite the rain, we could see rain rapidly moving into a wall cloud region. There seemed to be evidence of differential motion. This persisted with a wall cloud feed for 10 minutes or more. The wall cloud became wrapped by rain and passed just to our north and northeast. We moved towards the original intersection and parked. It was just before 6:00pm. We were at a stand still. What has gone wrong today? Moderate risk? What next? Do we go after this complex which was briskly moving into Oklahoma. I felt I needed time to gather some thoughts about the situation. All cells so far seemed to be raining on the updraught. Nothing except congestus were growing to the west in full sunshine. Soon they may develop but perhaps enter this region where the back sheared anvil was situated. 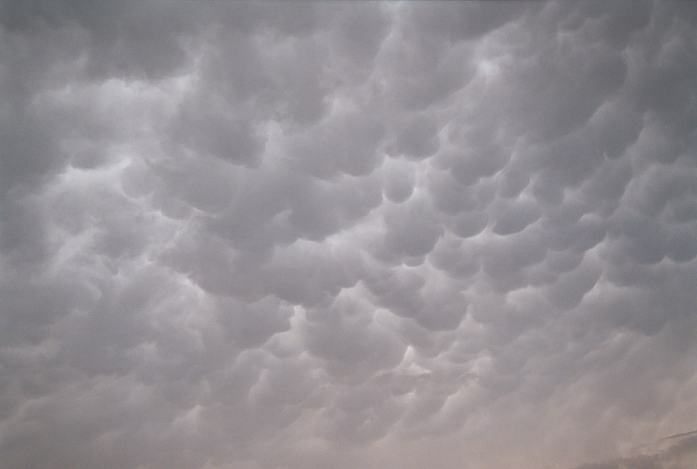 The back sheared anvil deserved a few photographs producing some nice mammatus. The storms were drifting further east. More cells from the south had merged into this line and I liked the look of one particular updraught. So instead of waiting for the congestus to develop to the west, we killed a little time chasing after this system to our east southeast. We joined the highway 287 at Quanah and turned east towards Vernon. We had passed through some large puddles of water left by the storms but this became increasingly significant in Chillicothe. However, I was concentrating more on another observation. 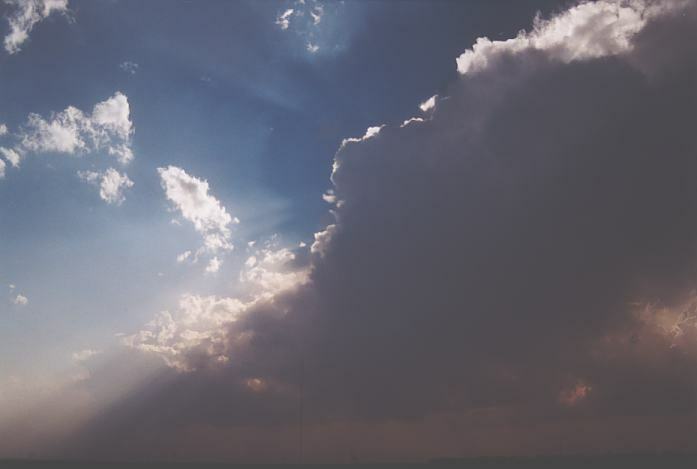 What I could not understand is that we had made progress to the clouds quite quickly. How come? A row of cumulus congestus clouds was making relative progress towards us. Finally we stopped to watch. Then it clicked - outflow boundary!!! Of course. Then I looked around and said - "where the heck did that come from"?? The congestus had rapidly entered under the anvil and had grown rapidly. Heading further west on 287 got us to a better vantage point. To the north west, there was a thin band of growing congestus - well it seemed. It rapidly indicated a greenish tinge structure and there was along band of scuddy inflow on the northern end. It seemed to me at the time that the storms were developing along the cold front? I thought this would be a squall line system. After all, I do recall a squall line was expected later. The word squall line was cemented into my head. I did however realise there was consistent inflow and also a lowering had appeared on the northern end of this storm line. 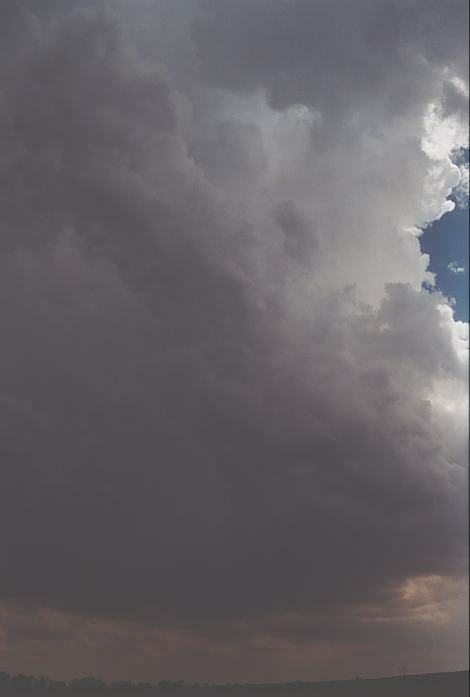 We headed towards it and intercepted it just north of Quanah. It was some of the greenest tinge I had observed in storms. Definitely significant hail indicated by the thick hail shafts within the precipitation. I was tempted by Matthew to remain under cover to get hailed on. Not a chance. 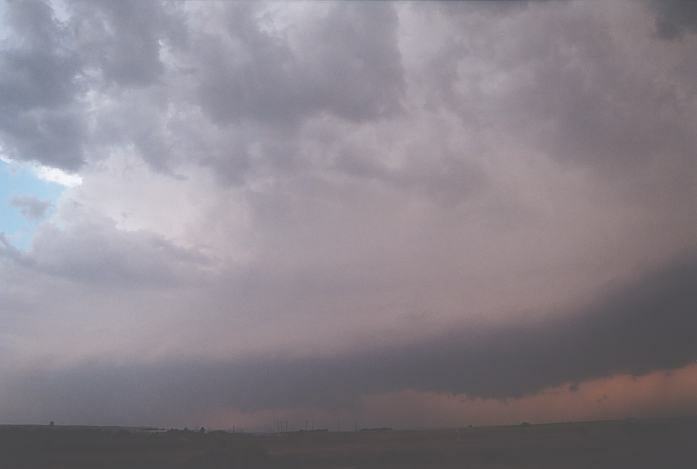 It was developing a nice shelf cloud formation and the southern half at least was outflow dominant but the rotation and inflow on the northern side deserved extreme caution. Feeling outflow, we remained ahead making sure we were out of Quanah before the storm would hit. Rotation was already evidentin the rain free base. Further down the road, it suddenly clicked this was a HP supercell. There was a lot of outflow racing out of the storm along the incredible green glowing shelf cloud. The lowering to the north had persisted. In fact, inflow had increased perhaps as the result of intercepting the outflow boundary. The northern end rain free base had developed with excellent curvature and now a nice cow catcher formation had developed. This storm was simply awesome!!! It was green and there were frequent lightning flashes with some bolts as well as constant rolling thunder. The storm precipitation had decreased somewhat with the inflow dominant behaviour now quite pronounced. The storm base was moving in towards the storm with in a structure indicative of a spiral!!! The adrenalin had to be kept under control. I knew, if anything, that this storm was showing all the signs of becoming tornadic with strong inflow!!! Yes the storm had become inflow dominant. The transformation was incredible. A bell shape updraught was now adding to the spectacle. 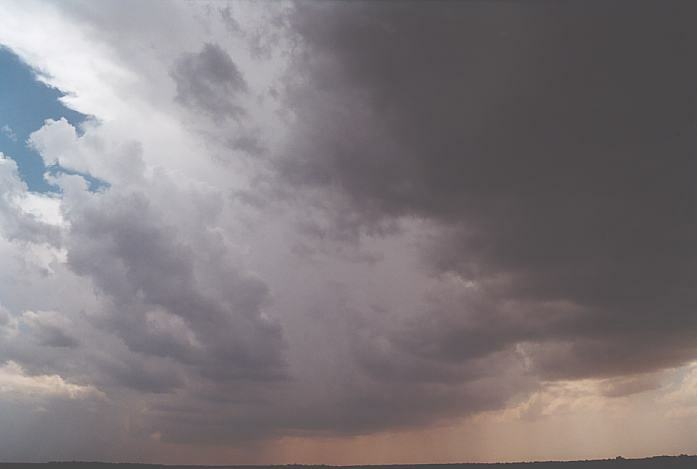 Rotation was even more evident in the lowering that had persisted for the whole time since interception near Quannah. Of course it was a much larger rain free area. Another possible wall cloud was observed further west. 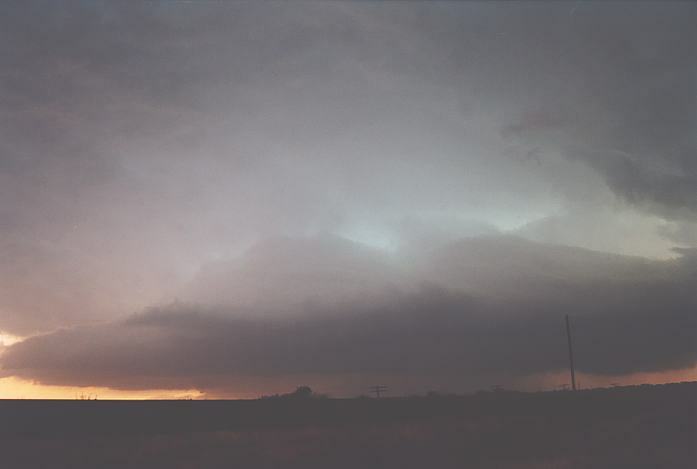 The storm then developed a spiral band with cloud base easily observed flowing towards the main core. The wall cloud indicated significant rotation. Then suddenly, a funnel nosed down rather rapidly! All I could say was "Look at the funnel...Come on... Yes. We're going to have a tornado!!" Then you would not believe what happened. Out of all the people in the United States and out of all the time it could have happened, the owners of the property who's drive way we were parked in arrived. Right when the tornado was in operation. I didn't know what to do. There was nothing else I could do. I wanted to point out the tornado to them as if to say "Give me a little time." or "Look at the tornado." But the expression on the face and a sort of lack of interest or not knowing about the tornado forced me to simply move the car. It was the quickest move and I was out in a flash. 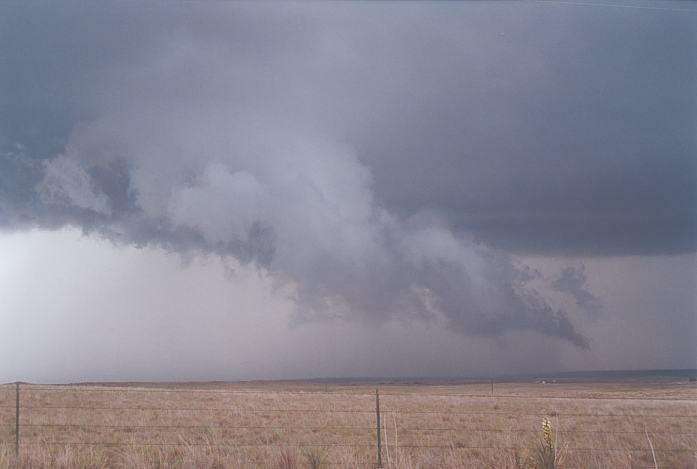 A large wedge funnel had developed within this time and again as we filmed. Then multi-vorticies danced around the major funnel. We had a multi-vortex tornado about 7:52pm - probably in the area near Medicine Mound, Texas a few miles to the west southwest (from near Chillicothe). Matthew and I watched and filmed as a few more multi-vorticies danced around the funnel. What a sight. I was so happy that Matthew had seen a full-on tornado full of rotation. All I could hear was "Tornado on the ground". I knew this was an incredible experience for Matthew - one he would never forget. This was more than one could expect considering the day was almost over and that nothing else was netted in the dominant storm complex earlier. The funnel lifted somewhat but the occasional multi-vorticies were still observed. Then, as if to close the show, the rain curtain slowly wrapped around to my disgust. I now knew the frustration of what other chasers have had to deal with in the past. The tornado was finally completely rainwrapped. Still pumped, we made a last ditched attempt to get into a better position. We became sandwiched in a small convoy of chasers but decided to eventually stop once we could see the rain come through. We decided to head east ahead of this rain. 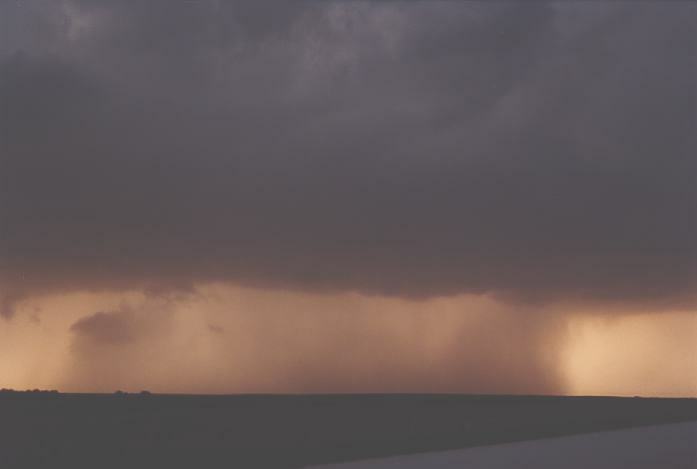 Some impressive contrast observed and filmed in possibly another supercell structure. We remained with this complex as we passed Vernon and headed towards Wichita Falls. 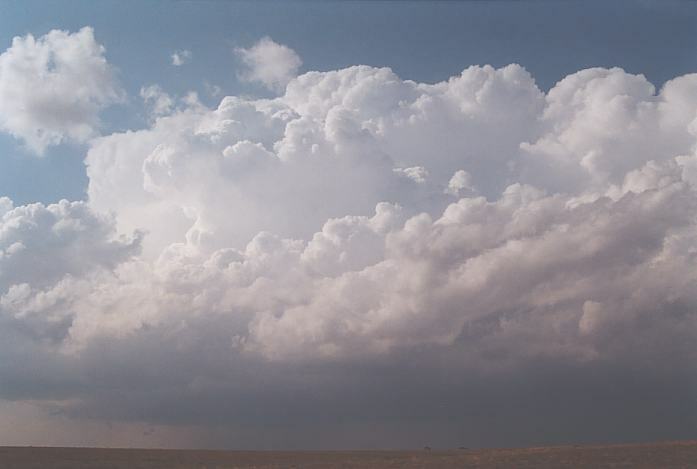 The main supercell was too far to the south so we remained ahead of the main storms. It was now close to sunset so we took an exit and filmed some more. Lightning flashed and crawlers occasionally lit the storm line. We were also in inflow and this inflow was leading to another lowered base. This remained intact for a few minutes with a rear flank downdraught evident but soon after it lost its structure (or cloud got in the way). On analysis from video, it seemed that there was a step structure in this cell. Back on 287 and destination target a MacDonalds in Wichita Falls. Should be chasers there!!! A little confusion at first but we found it finally. Where were the chasers? None that I could see. But really it did not matter. Matthew and I were back in reality. I started to tremble at what we had observed. 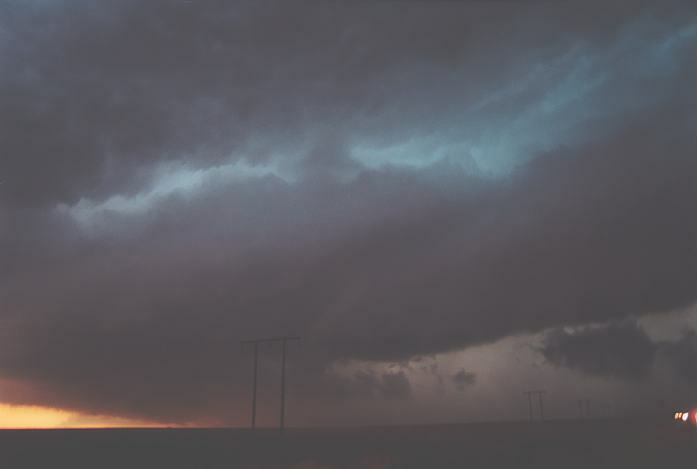 In a year where tornadoes were relatively scarce, we had tracked down a definite tornado. (We later found out very few chasers were on this event). We also were able to positively confirm that the Lipscomb tornado the previous day was also genuine. Finally, we were in our hotel for a well earned rest and ready for another day's chasing. 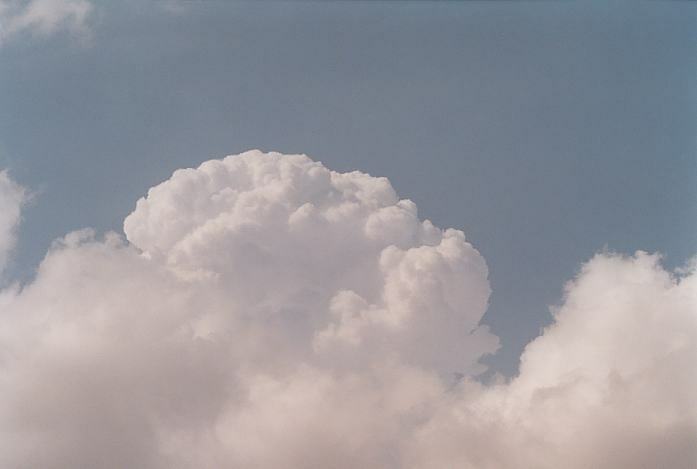 the development of large cumulus that had it broken the cap could have fed on some rich moisture in a high CAPE environment. some impressive lightning bolts and closer thunder. The next day, we headed back to Dallas since there was no availability of data. We used the opportunity to observe the region around Jarrell which had been hit by an F5 tornado a several years ago. To our disgust, we arrived home to observe the panhandle region and even Nebraska covered in anvils. The Texas Panhandle was the target region from a couple of days back.